Last Labor Day we spent the weekend with some friends down in Old Saybrook, CT, where we were introduced to the concept of cedar-smoked salmon. It was delicious to say the least, but since it was the last weekend of summer and near the end of grilling season, we didn't get a chance to try it ourselves until now. A couple weeks ago I saw cedar planks at the grocery store and just had to grab some to give this a try. The first step is to get the cedar planks soaking in water, submerged and weighted down, for about 30 minutes. The planks need to be soaked all the way through, or they run the risk of catching on fire when you put them on the grill. 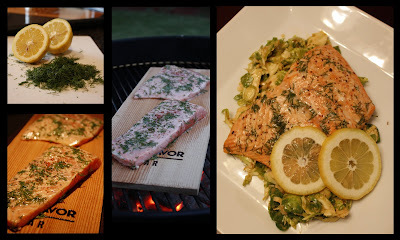 While the plank soaked I prepared the salmon and slaw. The salmon was from the grocery store; a cut called "chef's choice cut". I didn't realize until I got it home, but the skin had already been removed. Ordinarily, this would make the salmon virtually un-grillable, but since we were using the plank we figured they'd be fine, and they were. I dressed both sides of the fillets with olive oil, minced garlic, fresh dill, salt, pepper and a squeeze of lemon and let them sit for about 20 minutes while the plank continued to soak. Anthony and I planted Brussels sprouts in our garden, so we thought we should come up with some creative uses for them before we have Brussels sprouts coming out our ears in a couple months. We almost simultaneously thought of a Brussels slaw, using shaved Brussels sprouts in place of cabbage. I whisked together a dressing of 1/2 cup mayo, 2 T apple cider vinegar, 1 tsp paprika, 1 tsp celery salt, and 1/2 tsp onion powder. I shaved down about 20 Brussels sprouts using the slicing attachment on my food processor to get nice thin slivers and diced up some white onion. I tossed it all together, added salt and pepper and let it sit while we grilled the fish. When the plank was completely soaked, we carefully placed the prepared salmon on the plank and placed it directly on the hot charcoal grill. We put the cover on, sat on the patio with a cocktail and took in the aroma of the smoking cedar. The salmon just cooked on one side, about 15 minutes. (Make sure you stay nearby and keep an eye on it just in case the cedar catches fire!) We plated the salmon over a bed of the slaw and dug in. The smokiness balanced really well with the brightness of the lemon and dill and the slaw was better than we could have hoped. Anthony went back for seconds of a VEGETABLE. yeah, seriously.